President Mahinda Rajapaksa on Saturday stressed that he greatly valued the independence of the judiciary. Addressing senior journalists, artistes and writers at Temple Trees after officiating at the distribution of free laptops and interest free vehicle loans to them, the President said he had been a practising lawyer for 19 years and that he had great respect for judges, and greatly valued a free judiciary. Ministers Keheliya Rambukwella and Anura Priyadharshana Yapa and Mass Media and Information Ministry Secretary Dr Charitha Herath were among those present at the ceremony. President Rajapaksa said in the face of the law, politicians, artistes, journalists and all were equal. “Some ministers were jailed but I never interfered, or used my power to chage that. The public, the people of this country including myself, have the greatest respect for the judiciary. All should perform their duties maintaining decorum, self – respect, personal dignity and integrity,” he said. President Rajapaksa said journalists treasured freedom the most, more than computers and loans for motor vehicles. “There is that freedom today and we ensure you the freedom to write. Today you can travel anywhere you like, you can question anything and also can express your views, since you are really free. The Mahinda Chintana articulates what media freedom is. The freedom of journalists could be ensured when we raise the living standards of journalists. If not they become pawns of others,” the President said. He said terrorists who fought with arms then, now fight via the media and the money spent to purchase arms then, is today spent on the media. “Your freedom has been assured today unlike in the days of ethnic strife,” he said. “Under LTTE threats, no media person was able to question the LTTE about the killings of President Premadasa, Ministers Lalith Athulathmudali and Gamini Dissanayake or about the killing of Aranthalawe Bhikkus, Ven Dimbullagala Nayaka Thera, the attack on the Sri Dalada Maligawa and killing of devotees at the Sacred Bo Tree,” the President said. “The media was helpless and they had no way to question those killings. This is because if they were to question such atrocities, they would not have come back safe,” he said. 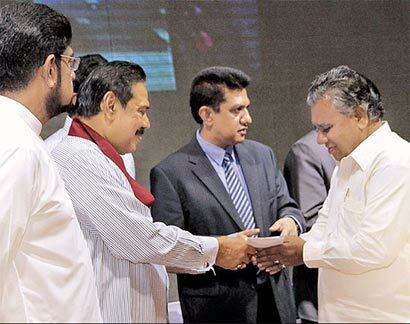 “That was the kind of freedom the media had at that time,” President Rajapaksa said. He said journalists need to do their duty with acute awareness and give the world the true picture of the Motherland.